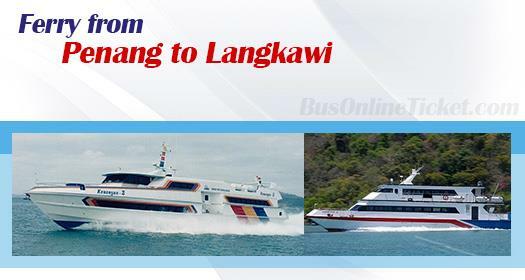 At BusOnlineTicket.com, there are two ferry operators that are established in the travel industry such as Hoye Holidays Sdn Bhd and Super Fast Ferry Ventures Sdn Bhd to ferry visitors to Langkawi from Penang and Penang to Langkawi through Penang Jetty Terminal and Langkawi Jetty Terminal. Hoye Holidays has been operating for almost 20 years of experience in the travel industry whereas Super Fast Ferry has spent almost 12 years that these years of experience have infused trust and confidence in visitors. Thanks to these two ferry operators, the trips from Penang to Langkawi and vice versa are scheduled to at least 4 trips each way on a daily basis to meet the high demand of the route. From morning to noon, trips are available for selection where visitors can select the trips conveniently via the booking machine at BusOnlineTicket.com to secure their preferred slots. Ferry is an economical transportation service as it only takes RM 75 to RM 80 each way. Penang Jetty Terminal, also known as Pengkalan Raja Tun Uda, is situated in Weld Quay, Georgetown. It is one of the oldest ferry terminals in Penang and it also serves as the terminal for Rapid Penang buses. Plus, you can even get to Penang Jetty Terminal via bus from various terminals such as Penang Sentral, Sungai Nibong Bus Terminal, Butterworth Bus Terminal and Bukit Mertajam Train Station. All buses in Penang heading towards Penang Jetty Terminal bears the sign for 'Jetty', which is synonymous with the ferry terminal because the ferry terminal is also widely known as 'jetty'. If you wish to get there via a taxi, there is a taxi stand located conveniently next to the terminal. Hence, it is completely convenient to get to Penang Jetty Terminal by car, bus, taxi and ferry. If you arrive ahead of schedule, you can take a walk along Weld Quay or Lebuh Pantai where you can find coffee shops or food court to satiate yourself in local delicacies. Once you are ready to get aboard, present your printed booking confirmation purchased via BusOnlineTicket.com to redeem the ticket from the counter upon departure. At the Langkawi Jetty Terminal, it is a one-stop solution for visitors as you can get food, souvenirs to even vehicle rentals. For instance, you can find various tour offices within the complex that offer rentals of motorcycle or cars at reasonable rates. However, as for visitors abroad who wish to rent motorcycles, they must carry a valid international licence as these tour offices are prohibited from renting motorcycles to foreigners that hold a motorcycle licence of their own country. Alternatively, visitors can opt for taxis if driving is the least preference while buses are very limited, which are not recommended as the main mode of transport. In this complex, visitors can shop and dine in the wide choices of shops and restaurants available, or even do a last minute shopping before they hop onto the ferry back to Penang. Plus, there are maps and travel guides that aid the visitors to get around the island while suggesting hotels, eateries and other must-go places. Hence, hesitate no more and start planning on your Langkawi adventure via our booking machine at BusOnlineTicket.com.